Here is a quesion from a site visitor asking how to wire a ceiling fan and light kit with separate control switches for the fan and the light. Question: I would like to wire two ceiling fans — the power comes into the box first — I would also like to have two separate switches for lights and fans. Any diagrams would be helpful. Thanks for your help. Answer: In the question above, I am assuming that this is a new installation, and as I understand the question, the power now comes in to the first ceiling box intended for mounting the ceiling fan. In roughing in wiring for a ceiling box that has a potential to have a ceiling fan installed either now, or in the future, it prudent to wire the circuit for separate control of the fan and the light kit on individual switches. Make sure you mount the ceiling outlet boxes firmly, and with extra support so as to handle the additional weight of the fan. 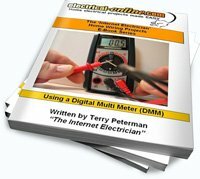 Check with your local electrical and building inspector, as well as the manufacturers recommendations. With the power coming in to this circuit at the first ceiling fan outlet box, here is how to run the cables for this circuit. 3-wire cable (switch legs) from first ceiling outlet, down to a 2-gang box for the first set of switches for ceiling fan / light control. 3-wire cable from 2nd ceiling outlet down to the second 2-gang box for fan / light control. Here is a diagram to show how this circuit will be connected. I will show only the first ceiling fan and control. Duplicate the spicing for the second ceiling fan / light. Note that ground connections are not shown to avoid cluttering the diagram. See THIS article for proper ground connections. When installing a ceiling fan, if you are dealing with existing wiring, there are 3 main issues that you must check out before beginning. Is the box that you are going to mount the fan to, secured well enough to handle the weight? Does the existing circuit incorporate a switch? Does the existing circuit provide for separate switching of the fan and the light kit? If the existing wiring has no provisions for switching, and changing or adding to the existing wiring is difficult or impossible, and it only has power present at the ceiling outlet box, then the pull-chain switches that are a part of the ceiling fan assembly will have to be used for control of the fan and the light. If the existing wiring has only 1 switch for control, and the power comes to the switch first, then you can only control power to the ceiling fan assembly via the switch, and you have to control the fan and the light with the pull-chain switches when the wall switch is on. 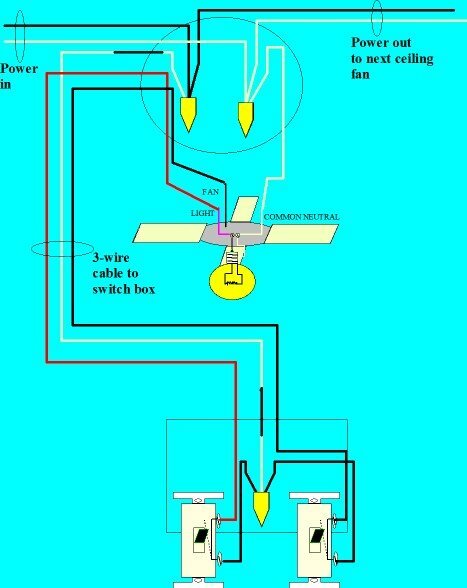 If the existing wiring is such that the power comes in to the ceiling box first, and then uses as switch-leg drop arrangement, you can control (for example) the light from the wall switch, and have the fan wired directly to power so as to use the pull-chain switch to control the fan. There are other options available as well, such as remote control devices allowing you separate control of the fan and the light kit if your wiring options are limited. This entry was posted in Electrical Wiring and tagged ceiling box, ceiling fan, electrical outlet, electrical wiring, fan control switch, how to install a ceiling fan, light kit, light switch, outlet box, outlets, switch, switch box, wiring. Bookmark the permalink.